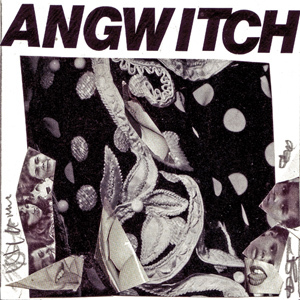 Angwitch is, effectively, a trilogy (bunched in with album 43, which is a double, all three recorded on the same date), agonisingly the only albums to feature what must be considered Radioactive Sparrow’s ideal line-up. It’s not for nothing that the only Radioactive Sparrow t-shirts printed to date featured the quartet that appears here, a design by Gage that groups together the four faces each wearing the same pair of cheapo kids sunglasses. You really get a sense of how much bigger than average Bargefoot’s head is when you see how much smaller the shades are on him than the other three. The recording of Angwitch was a gruelling business, the main session lasting 16 hours, starting in the Hut at 11am and finishing 5 o’ clock the following morning, all because they kept thinking they hadn’t recorded enough decent material to make up an album’s worth. One of the great beauties of producing work in this way (aimlessly recording limitless amounts of songs made up on the spot) is that what seems like rubbish at first so often turns out to be unexpected genius after a few weeks, months, even years cooling off – the ever-reinvented contexts of time’s eternal relay redefining the character of captured actions. Consequently, the next album, Blood Piss & Burps: The Truth About Angwitch and its flip-ternative Burst! are probably even better than what was originally selected. This exhaustive wringing out was supplemented by a living-room session without Gage the night before, during which the tape inexplicably went bananas in the machine (probably due to low batteries) resulting in wonky, sped-up songs to the group’s initial dismay. The two sides of the original C60 opened with tracks from the first Meltdown of the year for which the band wore floppy-flappy woollen hats that wobbled to the lilts, which got easy laughs. It’s easy to see why they’d have been so restless with what they were producing. By this stage in their development the intensity of content was increasing, the hunt for lyrical nuance and convincing riffs was at risk of becoming a tad urgent – they hadn’t yet learned to fully believe in the mantra ‘the worse the better.’ Not that they were anxious about any of it, mind: the persistent single-mindedness of Stews’s ‘Doodlin” is testament to their customary arrogance remaining immune to the threat of professionalist imperatives. Angwitch is about gaps and holes, failures to make clean connections and direct contacts. On ‘Ripper’ Stews sets about trying to improvise lyrics around threats of physical violence that rhyme with the name of its imagined victim, but superbly he never quite manages to make this work: ‘Hit you into the chest, Lest/Hit you into the groin, John… Kick you into the knee, Charles/Wanna glass in your face, Chase?’ Similarly, ‘Crush Marbles’ sees Bargefoot try and relate a story based on Hauptmann’s Bahnwärter Thiel, which never quite manages to make any sense, while on ‘Fly In My Eye’ his utter ineptitude at singing and playing the bass at the same time makes for an excessively disjointed lopsiding that virtually renders the effort devoid of any musical logic. ‘Doodlin,” on the other hand, is an impish enactment of the stuck record, resolutely refusing to expand on an idea. The word ‘angwitch’ came from ‘Drain Dreams’ on the previous album, Jupiter, in which Gage constantly fails to enunciate most of his lyrics properly.